I have to admit that Rhododendron don't really do it for me. Pretty in a rather smug and constipated way , and smiled at tolerantly in the way you do to a friends ugly children but not really a joyful thing. Every now and then I run into one that I like enough to grow. This one has fabulous purple-green leaves which make it distinctive and worth growing. The rather artificial purple flowers are a temporaray distraction. Geranium phaeum 'Mulberry Tart' . 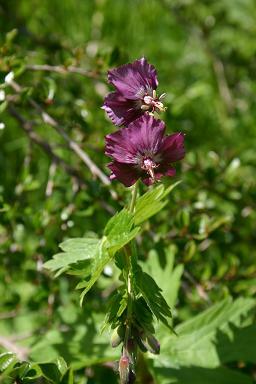 During the 1980's I was actively growing and selecting seedlings of Geranium phaeum. I named and released a few. 'Calligrapher' and 'Rose Air' are still in circulation, 'Dreamer' seems to have fallen out of favour and 'Heather' is, as far as I can tell, now extinct. Then at the end of the 1980's there was a boom in new introductions, many of them excellent plants, and I stopped raising them. The market was already saturated and confused enough without any further help from me. 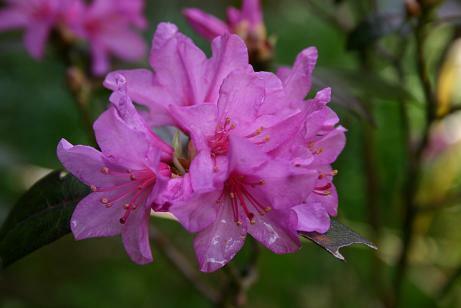 This large flowered rather ruffled seedling had been provisionally selected for further trial under the informal name 'Mulberry Tart', but it isn't really distinct enough to warrant a name. The reddish mulberry tones were inherited from my stock of 'Bowles Red' which still seeds about the place. Iris japonica 'Ledgers var.' . 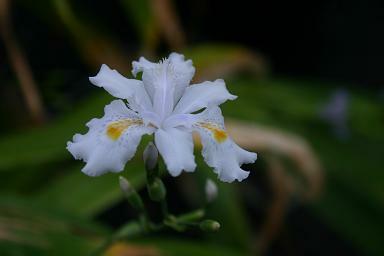 Probably to commonest and most satisfactory form of Iris japonica, which can sometimes be miffy and damaged by frost. Does wonderfully in moist shade (most unlikely of conditions), but looks a bit dog eared in sun and becomes limp and leathery if it gets too dry. The Sycamore is a splendid tree. Masses of tiny seedlings in spring are a small price to pay for the comfortable sheltering canopies of the adult trees. 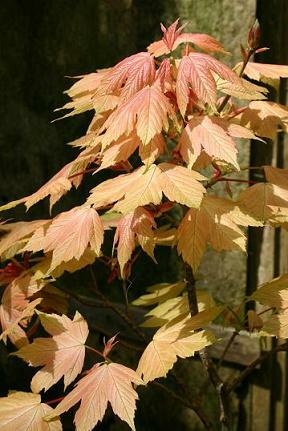 There is much variation in the colour of the first spring leaves, from golden green to bleeding beetroot. 'Brilliantissimum' has so little chlorophyll in the early years that it never grows to be more than a manageable dwarf. At it's best, in the sun, it is astonishing. By mid-summer it is a dull and dusty green blob. Unusually for me, I can never decide if I like it or not. I grown it in a pot on top of the inspection cover for the sewer, which it completely fails to disguise. It is either as perfect peach pixie, or vomit on a stick!